I am officially back from my honeymoon and back at work. Boo! You would think having two weeks off of work would help, but it hasn't. Or maybe it is the fact that I am now off birth control and my sleeping pills. Ugh. I miss my sleeping pills. But the doctor says no sleeping pills, try not to pain killers (aspirin, muscle relaxers, Vicodin, etc.) and take your vitamins. Well I was on pain killers....muscle relaxers and a stronger from of Vicodin right before my honeymoon because I somehow caused muscle spasms in my shoulder and neck. Stress? Probably. I was only on them a few days, but they helped me sleep while in pain. But back to my point, I have been on BC since I was 15, and this is the first time off of them. 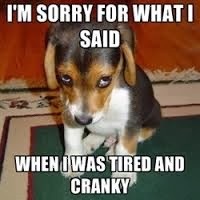 I feel more cranky. Ugh, I think the BC helped make me more tolerant of every day stupidity. When oh when will I start to feel back to myself again? Plus no sleeping pills (it was a low dose, but actually made me sleep longer than 5 hours a night) makes me more tired and cranky. Ahhh, can I go on another vacation? I hope making a shadow box of my wedding things this week, getting my professional wedding photos back this week and writing a post or two about my honeymoon will make me happier and less cranky. Plus I think my husband would like his sweet wife back. And maybe a wine night with the ladies would do the trick. Post wedding and honeymoon blues, I think so.